There was a time when the only hope you had of getting a real tomato in Australia was to grow your own. I’m talking about tomatoes grown in a garden bed and ripened naturally by the sun, tomatoes bursting with sweet luscious juicy flavour. I’m disappointed I’m unable to grow tomatoes on my balcony, I did try but there’s just not enough sun, so I have to rely on commercial producers. The growers who sell at Farmers Market have the closest thing to home grown but my local greengrocer also occasionally has heritage tomato varieties grown with tender loving care, real tomatoes that are grooved and misshapen and that smell and taste like tomatoes did before they became an industrialised commodity. For my last supper I’d choose sliced fresh late summer tomato that’s warm from the sun, seasoned with a flake or two of sea salt, a grinding of black pepper and a drizzle of olive oil. If you piled them on top of a slice of crusty sourdough bread to absorb the juices, I’d die a happy woman. 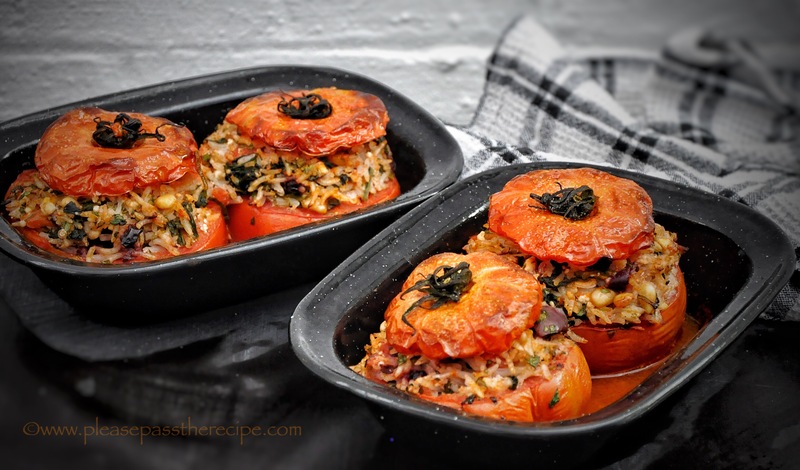 When tomatoes are in their prime, I also enjoy them stuffed with rice to trap both the juices and flavour, a few salty bits to intensify the savoury tomatoey flavours, some herbs and added pine nuts for crunch. They make a delicious meal with a side salad. If you’re stuffing tomatoes to bake for the first time you need to be aware that they need to be well seasoned. Don’t stint on adding sea salt and freshly ground black pepper to the filling or your tomatoes will end up bland. Leave the rice a little undercooked too, cook for just 10 mins as it will cook some more in the oven which leads to a warning, don’t overstuff the tomatoes when you fill them as you risk the skins splitting as the filling cooks and expands in the oven. Stuffed tomatoes are a little bit fiddly to prepare, but it’s a dish you’ll make just a couple of times each season when tomatoes are at their prime, and I think well worth the effort. If you love stuffed vegetables like I do you might also enjoy my stuffed red peppers and eggplants. Wash the tomatoes then slice a lid from the top. Set the tops aside. Use a sharp spoon to scoop out the seeds and flesh, but don’t remove the flesh against the skin. Separate the flesh from the seeds and juice. Strain the seeds from the juice and discard the seeds. Set the juice aside. Mix together all the stuffing ingredients including the chopped tomato flesh. Rub the outside of each tomato with olive oil. Fill the tomatoes generously with the stuffing but don’t stuff them too tightly. Place the filled tomatoes into a greased baking dish and spoon the reserved tomato juice over the top. Place the lids on top, drizzle over a little olive oil. Bake for 30 minutes . Serve hot or warm with a crisp green salad. Stunning! Now I can’t wait for summer! This looks and sounds great, but unfortunately there is no way to get tomatoes like that here. The climate doesn’t allow me to grow my own, and all the tomatoes available commercially are from greenhouses. I’ll just have to go to Italy, Spain, France to enjoy them. Love the colours of those dishes with the toms Sandra. Sadly I don’t think I’m going to have a ‘glut’ this year. First time in a very long time. Thanks Maree. Seasons vary, next year you’ll have tomatoes coming out your ears!. Love me a stuffed veggie and I haven’t stuffed a tomato in ages so thanks for the inspiration. Fantastic photo. How true! Living in an apartment I have the same problem. It’s a little depressing when the supermarkets try and stock tomatoes year round that have little flavour and are the price of a small country. But what a delicious way to eat in-season real tomatoes. I will be making this for sure. Absolutely stunning. Thank you! We often discuss out last meal – I understand the pure joy to be had from something so simple and delicious as my last dessert is just a plate of raspberries. Could be a faulty memory, but all tomatoes tasted like late summer tomatoes way back when I was a kid. Just a sprinkle of salt and I’d scoff them down like peanuts. Nothing wrong with your memory Mary, nothing at all because I remember the same thing, but then I was lucky because my Dad always grew them. These sound delicious, I cannot wait for summer tomatoes but it will be a few months! Stuffed tomatoes are my all-time favorite ! There is nothing like a good tomato. I grow them at Casa Debbio. I usually plant datero, a type of small egg shaped tomato. I like to stand in front of the bush, pick them and eat them right there, warm from the sun…heaven. We also have raspberries, cherries and figs. In a few years we should have apples, pears, pomegranates, mulberries and persimmons…roll on summer. I wish I could send you a bucket load. Ditto the last supper. That’s all I want too. Even without the bread. This entry was posted on February 23, 2017 by ladyredspecs in Cooking, FODMAP diet, Food, Gluten Free, Light Savoury Dishes, Main Meals, recipes, Vegetarian and tagged Fodmap, gluten free, seasonal, stuffed tomatoes, sweet summer tomatoes, tomatoes, vegetarian.